Like most parents, I love receiving a handmade or decorated card or craft from one of my children. Well, I actually love everything when it comes to my kids and although that sounds corny as can be, it’s the truth. Yes, cleaning the potty and middle of the night vomiting episodes are a bit tough, but you know what I mean. Maybe I cherish these deeds so much because I am a single parent. I once read an article that claimed “Single parenting is not for sissies!” and I agree 110%. I think I laughed out loud when I read that statement- admitting to “LOLing” may be even cornier than saying I like handmade gifts! As a single parent, as the name so aptly implies, you have to do everything and be everything. And since the statistics claim that more than 50% of children are being born to single mothers, I am certainly not alone. I think we would all like to be in a wonderful, harmonious relationship with our soul mate while raising our children, but for some of us, that hasn’t happened yet. I may have met a candidate for soul mate today at the bank, but since he didn’t ask for my number, well, I guess not. Anyway, where was I? Oh yeah. I would much rather be at the playground or beach with my kids, but some days we all have to stand in the RMV line or stay in while I do stacks of laundry. Some days I am super tired and I don’t know how I will get it all done. But, I wouldn’t change a thing. All the obstacles and juggling have made us a stronger family. My kids are so loveable and so brave. They haven’t had the Disney vacation (yet) and they know I don’t buy anything that isn’t on sale, but they also know I would do anything for them. I don’t miss a single moment. I don’t turn down a chance to read together, hear a poem recited, or bring them to a friend’s birthday party. And they don’t miss a moment telling me how much they love me, or in my daughter’s case, what a nerd I am or how my outfit doesn’t look good. Which, trust me, with such a keen middle school eye, I need her to tell me these things!! Anyway, my daughter’s card (above) has all these beautiful colored hearts in it and it reads, “A thousand (or at least a dozen) hearts for you.” I opened her card first and when my son saw it, he took his card back and said succinctly, “I am not done with my card.” He got down to serious business and then came back and handed me his card (below). 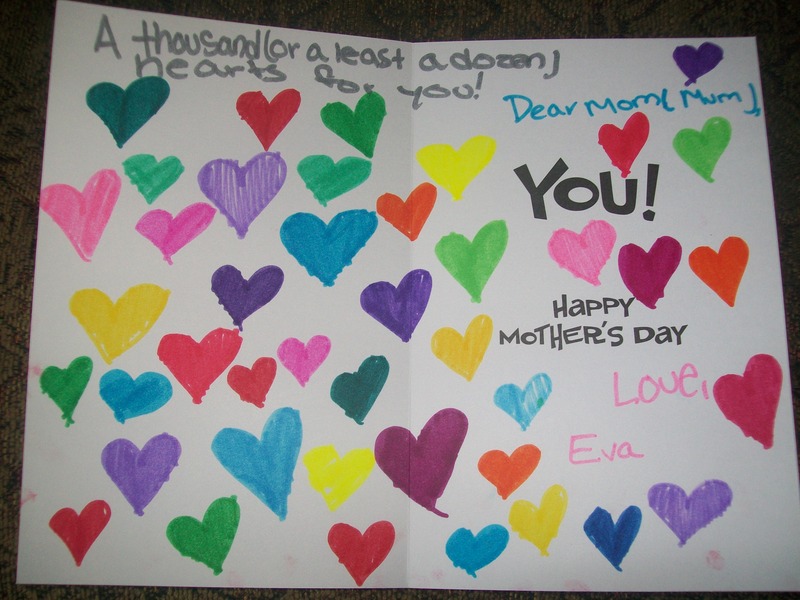 Apparently, he wanted to put in as many Momloves as Eva had drawn hearts. 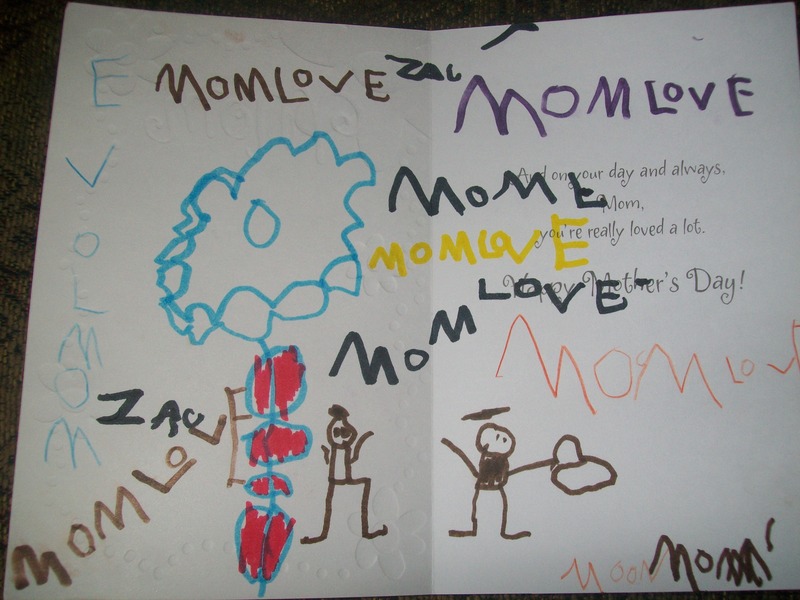 There are two stick figures, he and I, and then all these Momloves. He made up a new word: Momlove. How cool. I thought these cards were so heartfelt and wonderful and I couldn’t stop looking at them and smiling. I know we all have gifts that we treasure but I couldn’t resist sharing mine. My heart- or my dozen hearts- are forever filled with Momlove! This is so sweet! And I understand how big of a deal this is coming from a middle schooler!! Treasure those cards forever, I know you will 🙂 Happy Mother’s Day! !